Throughout the year, Dennis travels the country giving speeches on a wide range of topics and subjects. Over the course of the year it amounts to several hundred hours worth of speeches and lectures. 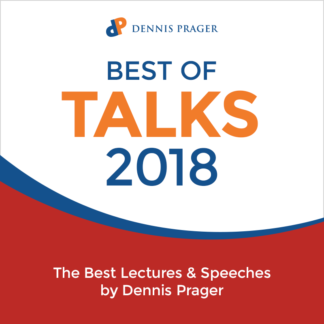 The Best of Talks 2018 collection includes five, hand-selected by Dennis and Allen, of the very best speeches and lectures. Why a Modern World Needs an Ancient Bible – Dennis reflects on his new book, The Rational Bible: Exodus – God, Slavery and Freedom. He explains why the timeless lessons from Exodus are needed more than ever today. What Does the Left Hope to Achieve? – What is the mission of the Left? To create a better world? To encourage stronger families? To maintain free speech? No. The Left seeks to create chaos. Dennis explains why. Jews and the Left – The United States has been a miraculous blessing for Jews. Once Jews knew and appreciated this fact. Now many seem to have forgotten it. Dennis explains the transition and its consequences from his perspective as a Jewish conservative. Was Joseph the Great Man of the Torah? – Moses, Abraham, Isaac and Jacob are the great prophets of the Hebrew Bible. Where does Joseph fit in? And is he the greatest of them all? Does God Intervene in Your Life? – What kind of God do you believe in? Do you believe in a God who created the world and took a hike; a God who created the world and intervenes on occasion; or a personal God who takes an interest in you? These are not easy questions.